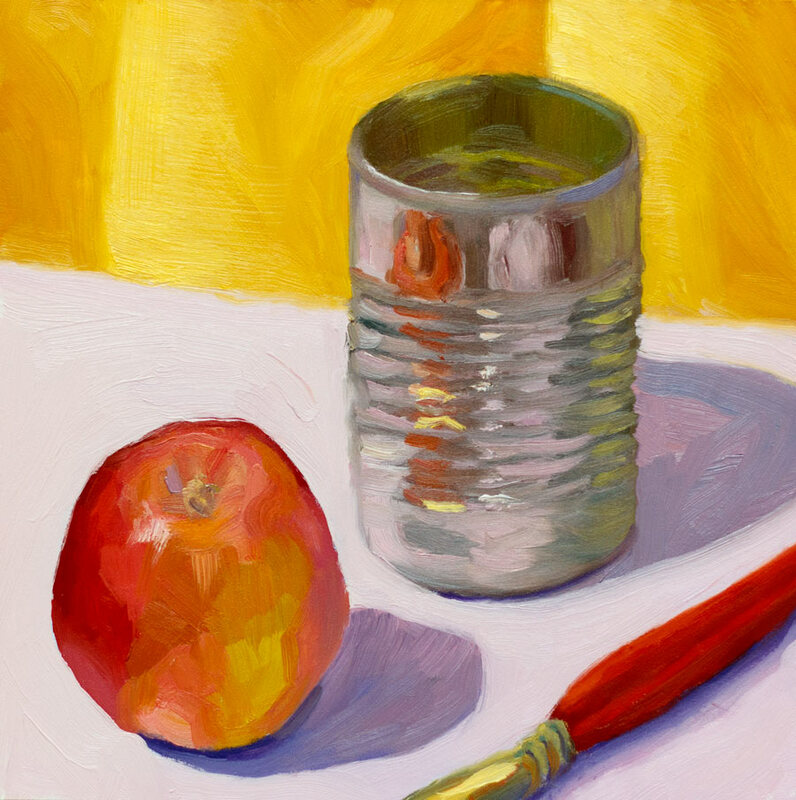 Apple Can Brush, oil on panel, 8x8"
I know the title sounds like random word salad but since the still life objects are equally random I think it is fitting. The tin can in the painting is from a can of Trader Joe’s Split Pea Soup. I was fidgeting with the can while the soup was warming in a bowl in the office microwave and in the process removed the label. I was struck by how pretty the can was and so to my office mates’ amusement, I washed out the can to take it home and paint it. It needed companions in the composition; an apple was handy as was a paint brush. I focused on seeing planes values, and putting the paint down and leaving it. The picture above shows the way I sketched out the composition with the planes on the panel with pastel pencil before painting. I really enjoyed the process and the results. Can’t ask for more than that! So many interesting and colorful things happening with the tin can! That can is so reflective. Who would have thought? Thanks for showing the drawing also. Very helpful. What an interesting combination! What an attractive painting! I give you the prize for the most attention grabbing title this week! Love the reflections in the can. The colors are wonderful. And you are right: the can is beautiful. You should paint it some more, with the same or with new companions. Thanks for the compliment and the suggestion. I think painting it again is a good idea because I didn’t feel I quite did it justice the first time. I just redid another painting that was 100% improved the second time around. 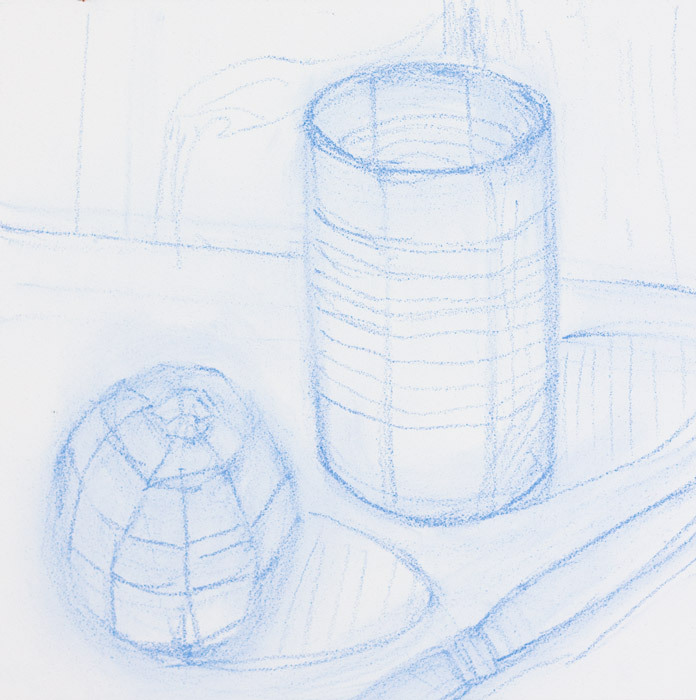 The way you captured the tin canniness of the inside as well as the outside is what makes us love the can! More can please. The drawing of the planes was an interesting insight to the painting process. You’re learning so much from those videos and it is really showing in your results! This is wonderful, even for an odd collection of items! Thanks Raena! It’s true, I feel like I’ve made some real progress lately.